My question is about the notation of chords and what that notation conveys (mostly applied to jazz and the notes that are implied by the chord symbol). A chord symbol notated with a '7' alone indicates a particular quality for the 3rd, 5th and 7th. So if someone writes CM7, then we know that the 3rd is major (and not minor, augmented or diminished), the 5th is perfect (and not augmented or diminished), and the 7th is major (and not minor, augmented, diminished, double diminished). The existence of a perfect 5th eliminates the existence of an augmented 5th, and vice versa. It doesn't make sense to convey a major augmented ♯5 mood by writing a CM7 chord, because the CM7 chord symbol indicates that the 5th is not augmented. However, since the CM7 symbol doesn't specify the quality of the 2nd, 4th and 6th, it could convey a lydian, jonian, harmonic major mood, and others. Is this reasoning correct? If this reasoning is correct, CM7(♭5) cannot express a lydian intention because the chord notation would imply the absence of a perfect 5th and a lydian mode contains a perfect 5th. So if the intention is a lydian feel, then the appropriate chord would be: CM7(♯11) (being aware of the 9th, which usually is not a problem). In practice it seems to me that this information, embedded in the chord symbols, is overlooked and G7(♯5) is treated as the same chord--with the same implications--as G7(♭13). The idea here is that different enharmonic spellings imply different available notes (and therefore scales), particularly in regards to alterations like ♯5 vs. ♭13 and ♯11 vs. ♭5. This idea could only be implemented when dealing with the known diatonic scales and their modes, because one can point easily to scales with two types of 5ths or 7ths, etc. Is this something to pay attention when reading charts or is there no hope in this level of formalism? I agree completely with everything you've said, including the motivation for the question and the specific examples you've given. Musicians rely on written music for communication. Granted, when learning an unfamiliar song, the most ideal scenario is to listen through original recordings of the tune, talk to other musicians, and hear how they play over the song. But sometimes those options simply aren't available. Imagine we're on a gig and the bandleader calls a tune we don't know. We open our real book, and it only gives the chords. We see G7(♯5) and need to know what chords to play and what scales to use. All we can rely on is what we see on the page. The conventions for writing and interpreting chord symbols are important and have many real-world implications. As a general principle, the particular enharmonic spelling we choose for the chord alterations matters a lot. A ♯5 is different from a ♭13, and the choice has different implications. At the most fundamental level, a ♯5 implies the omission of a ♮5. Similarly, a ♭13 implies the omission of a ♮13. Given this fundamental, basic distinction, we can build larger implications too. In general, I was taught the following four conventions when reading chord symbols for dominant seventh chords. These conventions come directly from chord-scale theory. They describe chord symbols, but more importantly, they describe the underlying scales from which the chords are constructed. A ♯5 implies a ♯4. A ♭13 implies a ♮5. A ♯11 implies a ♮5. A ♭9 typically implies a ♯9 and vice versa. Both scales contain a ♭2 but no ♯2--this breaks the fourth convention from above. The good news is that adding a ♯2 to either scale would generally sound good and wouldn't clash. So following the fourth convention is still safe thing to do, as a general guideline. Doing so won't really get us into much trouble. Using the conventions above, we can look at some common dominant 7th chords and figure out what scales would sound good over each. The first chord symbol shows what we might see on a lead sheet and the second chord symbol shows the chord again with the implied tones written in. As with anything, these are guidelines are loose, and that's especially true in this case. These conventions are best viewed as providing a solid first choice in scenarios where several options might exist. Out of everyone in the band, the soloist generally has the most liberty. For example, it's extremely common for a soloist to take a G7(♯5♯9) chord and treat it as G7(♯9♭13) with a ♮5. But the rhythm instruments must be a little more careful when making these changes. Imagine a pianist is playing chords behind a horn solo. The pianist sees G7(♯5♯9), replaces it with G7(♯9♭13), and plays the ♮5. This is a little riskier because it would likely clash if the soloist is playing a G altered scale or if the bass is playing a G altered scale. If I were the pianist in this scenario, I wouldn't replace G7(♯5♯9) with G7(♯9♭13) until I heard the soloist play the ♮5. Is a so-called C7M(♭5) occurring in a C lydian, really a C7M(♭5) or more properly a C7M(♯11)? Is a so-called G7(♯5) occurring in a G phrygian, really a G7(♯5) or more properly a G7(♭13)? How are some chord notations more suitable than others? What does it mean by "foo is more properly called bar"? What does a suitable name conveys in the realm of music analysis? Why do we call a chord, a certain chord rather than others? What is in a name? It depends. Without context, it is futile to continue such discussion. A note might be a ♭5 if it is passing from 5 --> ♭5 --> 4. A note might be a ♯11 if it is superimposed by many thirds, being in the original position, thus the 11th interval is able to be perceived. In the high classical age, a chord symbol inherently suggest a major or minor key. Despite modern freedom, one usually has in heart the canonical example. 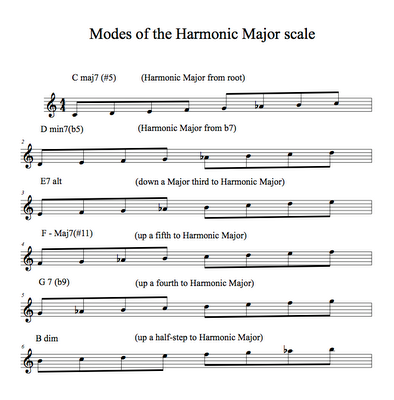 More important is why you think a non-scale note can exist by itself, without breaking the sense of a mode? The 4 ancient modes, dorian, phrygian, lydian, mixolydian, were mainly used in the strict-counterpoint age. If you want to convey the sense of Church music, you might not add too much non-Chord tones. It's true that notes with accidentals --- false notes --- did exist, but they were mainly a temporary device to avoid tritone (augmented 4th). What is it? We are not sure. The key signature has A major or f minor, but the music does not suggest so, and neither does a pure listener know the key signature. But A, B, ♯C, ♯D, F, G are particularly stressed: a totally symmetric, uniform, so called whole-tone scale, mysterious, without any direction. Among them, ♯C is very evident, while G is also picked out because it is both the lowest point and highest point of the phrase. But later, a perfect fifth is outlined, namely A -- E. Because ♯C is always hovering in the right hand, this seems to be a A major chord. But ♯C -- D are perversely repeated, and a sense of lydian mode persists. You can continue the process to for the rest of the piece. Following your logic, you might call this a A7(♭5). Is this meaningful? Maybe. But nothing can replace the effort of really attending to the music in real time, recognizing something to be another, or turning out mistaken. Listening to music is an active process. You don't passively identify, "Oh yeah, this is a C7M(♭5). Tell me it is if it is, or tell me not if it's not." No, hear it yourself, or hear it another way. It is a holistic process to perceive music. This is why a computer cannot analyze a music piece, so much as it cannot "read a book" in the human sense. If it could --- listen to or read in the human sense --- then this is a real AI, completely indistinguishable with the humankind, and we had better be prepared. I am simplifying a lot of things, and each topic can easily be extended to a short essay. Tell me whether this address your question. If you have a particular passage in mind, I would suggest that you open another question to draw more attention, and I will be willing to analyze (and to be upvoted). Let me first clarify that we can talk about two DIFFERENT topics here (both of which I think are interesting): 1. theoretical musings of music theory for the sake of discussion, and 2. Theoretical music for the purpose of PRACTICAL playing (e.g. what is HELPFUL). You make some interesting points (and I think we would get a long just fine with our mutual interest music-theory-musings) but allow me to make a point or two as I'm primarily concerned with what will help me play better... what SOUNDS good. The real problem with asking the above question, is that you are trying to create rules for yourself that DON'T EXIST. The thing is, when somebody has written CM7#11 on a page of music, they are not at all telling YOU what to play. Instead, they are giving you notes to RELATE to (in the case of C7M#11: C, E, G, B, F#). Moreover, I think even the rules are made to be broken. I don't have time to dig, but you wouldn't have to look far in a Charlie Parker or Kenny Garret tune to see them 'breaking the rules', i.e. playing notes that 'don't belong.' We are all familiar idea of 'playing outside' and of course, a player of great taste can make bad notes sounds delicious! Then again, as Aminopterin pointed out, context is everything, and there are certainly situations where a soloist is aware of an 'avoid' note as it might clash with another instrument, certainly more often with dominant chords. Now in regards to CM7b5... 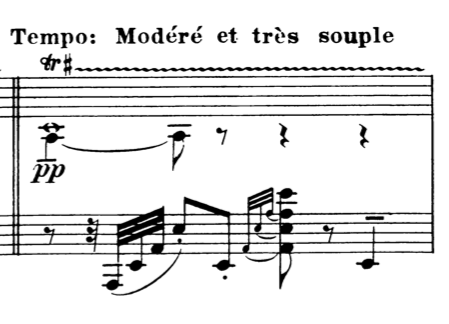 I suppose theoretically a composer could desire the absence of the perfect 5th. But he might want to mention it to the musicians before the session -- and they might still play that perfect 5th anyway! Of course, the perfect 5th will be a fine sounding note. Not the answer you're looking for? Browse other questions tagged notation chord-theory modes or ask your own question. Blues Scale: F Sharp or G Flat?